For example, if we have a solid cylinder,the term curved surface area is representing the extension of only the outer-area where the extension of top portion and bottom portion wont be included. The top portion and bottom portions are circles. In total surface area of a cylinder,if we exclude the areas of top portion and bottom portion (areas of the circles we have at the top and bottom (base) of a solid cylinder)we get the curved-surface area. Here "r" represents radius and "h" represents height of the cylinder. And for the shapes like cone, we don't have any specific shape at the top portion. But we have the circle at the base (bottom). So when we want to find the curved-surface-area of a cone, we need to find the area that exclude the extension of the bottom portion or base.In the top portion. We don't need to exclude anything. Because there will be only one vertex at the top.So we don't have to exclude any thing at the top when we want to find curved-surface-area of a cone. 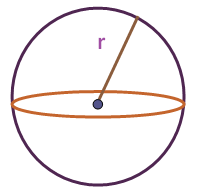 Here "r" represents radius and "L" represents slant height of the cone. When we consider the above three shapes on curved surface-area, it clearly says, that we have to exclude the extension of top portion and bottom portion in cylinder. 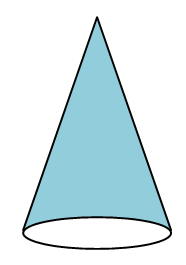 In the shape cone, we have to exclude only the bottom portion.In sphere, we should not exclude anything. So, for the shape sphere the total surface area and curved-surface-area are equal.